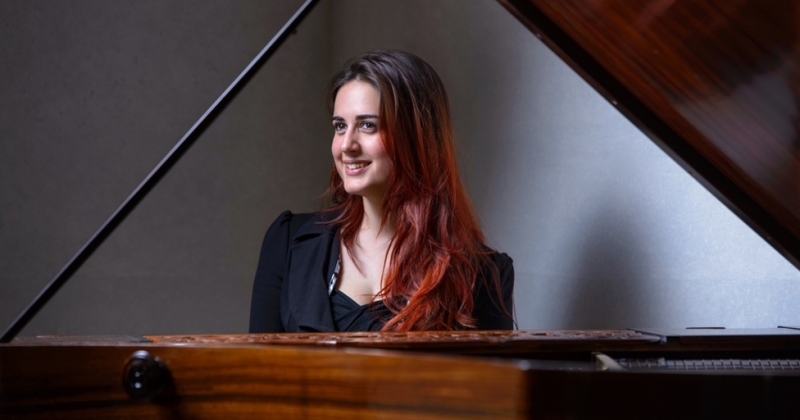 Winner of the “Prize Janina Nawrocka” at the International Piano Competition F. Chopin in Warsaw (2010), Leonora Armellini was born in Padova in 1992, and graduated at the conservatory, with the highest marks, when she was just 12. She performed in more than 500 concerts all around the world, including the “Weill Recital Carnegie Hall” in New York, the Mariinsky theater in Saint Petersburg, the Salle Cortot in Paris, the Steinway Hall in London, the Tongyeong Concert Hall in South Korea, the Musashino Concert Hall in Tokyo, and the “Stein Auditorium” in New Delhi. Leonora is considered a very versatile pianist. She plays in due with the violinist Edoardo Zosi, and cooperated with Jeffrey Swann, Mario Brunello, Giovanni Angeleri, Lucia Hall, Sonig Tchakerian, and the Trio Broz. Together with Matteo Rampin she wrote and published the book “Mozart era un figo, Bach ancora di più”, published by Salani in 2014, that was reprinted three times in a few months.